New Brunswick, N.J. – A pair of researchers at Rutgers Cancer Institute of New Jersey has been awarded nearly $2.5 million dollars to further study in their respective laboratories. X.F. 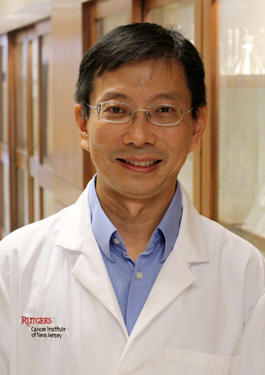 Steven Zheng, PhD, co-director of the Cancer Pharmacology and Preclinical Therapeutics Program at the Cancer Institute of New Jersey was awarded a five-year $1.65 million grant (R01 CA173519-01A1) from the National Institutes of Health (NIH) to examine an activating mechanism of the mTOR protein, which is a central controller of cell growth and metabolism. This ‘trigger’ – known as a small GTPase enzyme and recently identified by Dr. Zheng and his team – causes mTOR function to be heightened, causing tumor cells to gain growth advantage. Since cancer cells are often ‘addicted’ to this increased signaling, the mTOR protein is considered a desirable target for anti-cancer drugs. Currently, there are agents approved by the Food and Drug Administration that are designed to block the mTOR function in advanced kidney cancer, with implications for effectively treating advanced bone and soft tissue sarcomas. The aim of this research is to further study the role of this GTPase enzyme as it relates to cancer progression, prognosis and therapy. Zheng is also a university professor at Rutgers Robert Wood Johnson Medical School. Darren R. Carpizo, MD, PhD, FACS, a surgical oncologist in the Gastrointestinal/Hepatobiliary Oncology Program at the Cancer Institute of New Jersey, was awarded a five-year grant from the NIH (1K08CA172676-01A1) totaling $794,790. The funding will be utilized to further explore the effects of a compound identified in Dr. Carpizo’s laboratory that is found to restore tumor suppressor function of a mutated p53 gene in cancer cells. Previous research by Carpizo and colleagues demonstrated that this drug compound targets cancer cells with this particular mutation while leaving normal cells undisturbed. While the compound serves as a lead agent in developing anti-cancer drugs aimed at this specific mutation, Carpizo and colleagues are now exploring other chemically-related compounds to see if they will have a similar effect. 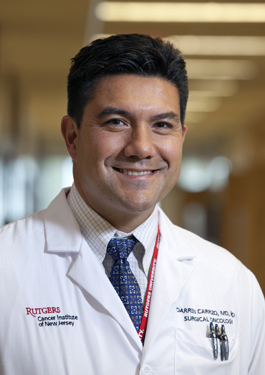 Carpizo is also an assistant professor of surgery at Rutgers Robert Wood Johnson Medical School.